Ten years have passed since September 11, 2001, the day Islamic terrorists carried out the deadliest terrorist attacks in American history. Militants connected to Osama bin Laden’s extremist group al-Qaeda hijacked four airliners and crashed them into the World Trade Center towers in New York City and the Pentagon near Washington, D.C., killing over 3,000 people. Some 10,000 New Yorkers were injured, many severely. Among the dead were hundreds of firefighters, police officers, and other emergency personnel who perished while rescuing thousands of people from the WTC. One airliner crashed in rural Pennsylvania after a handful of brave passengers overpowered the hijackers, preventing them from reaching their intended target (possibly the White House or U.S. Capitol). The traumatic events of 9/11 impelled the United States into a global war against terrorism. This tenth anniversary will memorialize those who died in the terrorist attacks that day as well as those in the military, law enforcement, intelligence or homeland security who have devoted their lives to the nation’s security. The commemorations will focus attention on the events that have defined the course of U.S. history in the 21st century. The Obama administration sent guidelines to government officials both at home and abroad to suggest how best to honor the memory of those who died in the terrorist attacks on American soil while also recalling that extremist groups such as al Qaeda have, since 2001, carried out deadly attacks elsewhere in the world. President Obama will give a speech on Sunday, September 11, from New York, where he will be attending memorial events. At Ground Zero, as the WTC site became known after 9/11, a 104-story skyscraper called 1 World Trade Center is under construction. Originally called “Freedom Tower,” it will be 1,776 feet tall. 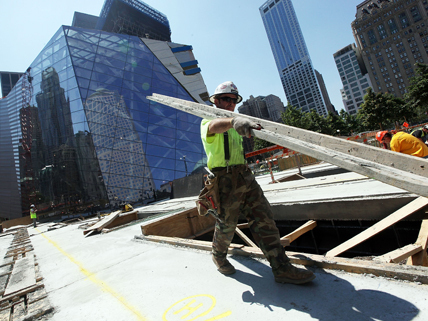 Within the “footprint” of the former Twin Towers is the National September 11 Memorial and Museum. The memorial is being unveiled at this year’s commemoration. Explore the rich video, narrative, photographic, and interactive resources of History.com concerning “the day that changed America.” Watch unfiltered “eyewitness” videos from nine New Yorkers and explore the “World Trade Center Reborn: Infographic,” video clips including “9/11 Timeline,” “Birth of Al Qaeda,” “How the Towers Collapsed,” and “Rebuilding Ground Zero”; photo galleries; and more. Learn how the Obama administration is seeking to shape and coordinate the themes underscored and tone set in official commemorations of 9/11. Check out this fresh perspective from surviving children who lost parents in the terrorist attacks on September 11, 2001. Discover the evidence of dark plots that was recovered by U.S. Special Forces from Osama bin Laden’s Pakistani hideout. i agree with richard. everyone should know what a horrible day that was and it should NEVER be forgotten. And I thought I was the sensbile one. Thanks for setting me straight. This could not psoisbly have been more helpful! this is a very sad story about what happen during the 9 11 but im happy now becuse it is over with now……. i wanna delete that, i ment to say how sad……. wow that must have been quite over-whelming. that was a horrible day!!!! Yeah! WHAT DID WE EVER DO TO YOU!? Yup, that’ll do it. You have my apperication. i was only a year old when it happend, so i don’t remember anything but when i read and here about 9/11 i can’t help but feel bad. my parents keep saying that they can’t beleive it has been 10 years since 9/11 happend. i’m sorry for all the people who lost love ones. I feel so sorry for those childern and there familys that where hijacked by those horrible people I hope that it does not happen to us!! this article was a very well written article and i was moved. i was 2 or 3 when this happened and i remember my mom stop and start praying. i watched as the second plane flew into the second tour. being a 2 year old you dont know what was happening. but today now that im 13 i can truly understand that what happened that day was heart breaking. i pray for evryone who lost a loved one and everyone who risked their lives to save some one elses. Oh yeah, fabluous stuff there you! ); so sad glad i was not in it or my family!!!!! couldnt agree more!!!! if not in this world then the next!!!! Woot, I will certailny put this to good use! I feel awful for all of those who lost their loved ones. I’m so mad at the hijackers. IT IS SAD AND EVEN SADDER!!!!!! The saddest of all of it, is that similar occurrences happened throughout the Middle East and Africa pre and post 9/11 and still continue, and nobody cares or knows anything about it. Sad 🙁 Innocent people died! OMG sooooo sad!! tear tear! Iwas only 2 when it happened but I wish I would stop remembering it. What’s it take to become a sublime exuodnper of prose like yourself? I still remember and i will always remember what happened on that day. Yeah. 10 years isn’t that long. Plus, it’s over. No need for bringing the subject back up year after year. It’s annoying. ummm yeah there is!!!!!!!!!!!! thats important to know how many people died because of these terrorists!!!!!!!!!! and especially the people who risked for these people ( police, etc. ) so yea there is!!!!!!!!!!!!!!!!!!!!!!!!!!!!!!!!!!!!!!!!!!!!!!!!!!!!!!!!!!!!!!!!!!!!!!!!!!!!!!!!!!!!!!!!!!!!!!!!!!!!!!!!!!!!!!!!!!!!!!!!!!!!!!!!!!!!!!!!!!!!!!!!!!!!!!!!!!!!!!!!!! Did this guy even know how many loved ones he killed i am sure maybe millions of kids ,familys, workers. osama bin laden should have though before he acted and as an american i think that it is about time that navy seal 6 killed osama bin laden they where very brave to take him out with afghanistani officials or anybody seeing them in sight but the question is still a mystery how did he escape from new york city on 9/11 of the terriorist attack or was he in the city before the terriorist attack and figured out ways and then took our nations beautiful twin towers but this is very wrong of osama why do people do these kinds of things? how did osama hijack the airplane? why did he do what he had done? why did those people help him with the operation ? see us citizens why did the people terriorize the pentagon why would they do that why? im just glad that laden is dead. I always wonder what America has done for people to want to destroy many innocent lives. i really feel orry for the people who lost the family members and im so happy that it is over and i feel sorry who are gone exept the people who crashed the towers.THANK YOU for reading my comment!!! :[ for the people who lost there family members. i was wondering what they would ever put in place of the twin towers. yes it is a very good thing he is dead!! what did we ever do to him? when the first tower was hit someone should have evacuated the second one just to be safe but no one did, why is that? that is really scary i mean who has the right mind to take years to study this and have the guts to actually do, killing people on planes and crashing our world trade center?!!! Thank you so much for this artlice, it saved me time! i am fortunate enough to not have lost any loved ones in this tragic event. i feel horrible for those who did. i do not remember any of this day through expirence, because i was only 2 years old at the time of the event. i do knnow about this day through text and photographs and even by word. i hope all of the people who were greatly affected by the event of 9/11 are doing good today and forever on out. I feel so sorry for those people who lost there lives.those terrorests disgust me. i feel so sorry for those people that lost there lives at the 9/11 disaster.those terrorists disgust me. i didn’t read it , but it was proboly sad. my sempafy means the world to me that we survied. I don’t know anybody who survived or died in the 9/11 attacks, but 9/11 must have been a really tragic event. If I had known somebody who survived or died in 9/11, then I would have prayed for him or her every day to make sure that person is safe from those crazy terrorists. I know they are part of the Al-Queda terrorist group – I learned it last year in Social Studies. I’m in 8th grade now and still in middle school. I was really young when those terrorists attacked the Twin Towers. Now I’m 14 (soon to be 15 in two months) and a teenage girl. God bless those who died on 9/11. They all live on in our hearts. that was just sad what they had did millions of people died.for no reason and like yal’l still ain’t catch the peolpe that did it. and o felll bad for the people that lost thier loved ones love myracle dudley. is so sad….. it make me cry!!!!!!!!!!!!!!! I feel so sad about that.That was the greates twin tower ever!!!!!!!!!!!!!!!! Im sorry what happen…. i wish i was there to help the people in there!!!!!!!! he prably isnt dead but he will be back…i wish they didnt have to die but he did !! Im sorry about the famouse twin towers!!!!!!!!!!!!!!!!!! i think it was a terrible remembrance of something and sombody so cruel that hed form a group 2 kill inocent people. Im glad Osama is dead. That idiot shouldn’t have messed with America. Some of the kids in the Middle East were taught that the destrution of the towers was Allah’s will. If they had been educated correctly, they would not have celebrated the death of so many people. Awesome information about the attack for people that didn’t know anything about it!! This is the saddest thing evah and i have to write an essay on it!!!! It is so terrible. Why would someone kill hundreds of innocent people? So sad.I was 7 months old when this happened. i would all so like to i was almost 1 when this happened birthday is tomorrow.